HomeAutoMobilesNano Was Not Bad But Also It Failed, Why? Nano Was Not Bad But Also It Failed, Why? The main reason Tata Nano slowly keep on declining in the market is due to its same marketing strategy which actually made it popular and lovable at starting. Now you may be thinking how can the same marketing strategy make something popular initially and later become harmful for the same thing. Well, we are definitely going to explain that within this post. So, this post will not only make you clear why Tata Nano failed to capture the market but also you will find out how the same marketing strategy can be good at starting and bad later. So, if you are from the marketing field, this article definitely going to give you some lessons as well. However, most people think that Nano failed due to its body design or due to its look or due to its build quality and so on. Well, the reality is not that. However, we don’t deny that Tata Nano had failed the NCAP crash test and got a 0-star rating for (Adult Occupation Protection). But, that was not the reason for its failure because its all competitors had also failed the NCAP crash test and got a 0-star rating for (Adult Occupation Protection) such as Maruti Suzuki Alto, Datsun Redi Go, Hyundai Eon and so on. Actually, not only the competitors of Nano but even more expensive cars than Nano which is manufactured in India had failed the NCAP test and got the 0-star rating for (Adult Occupation Protection) and those cars are Maruti Suzuki Swift, Hyundai i10, Maruti Suzuki Eeco, Maruti Suzuki Celerio, Mahindra Scorpio, Datsun Go and so on. So, it was not due to the safety concern that Nano has failed otherwise other 0-star rating cars won’t be selling in India even when all of them were expensive than Nano. So, was it a design? Well, different people like different designs. So, Nano was not ugly as well and people, of course, can consider the look of Nano according to its price. Was it a cheap material? Well, all the entry-level cars manufactured in India have almost the same quality materials, and even other entry-level cars were double or even more than the price of Nano. So, so if those cars could capture the market, why Nano didn’t? OK, now let’s come to the point. Now you are already clear that Nano was not bad compared with other entry-level cars manufactured that time in India and even the price of Nano was less than half of the other entry-level cars. So, why people at starting eagerly awaited for the launch of Nano and even made lots of booking but later it failed to capture the market? It’s because of its marketing strategy. Yes, the same marketing strategy due to which people were desperately waiting for the launch of this car made the bad impression later for the same car in the market. Well, you will find out which marketing went wrong later in this post. First of all, let us tell you the whole story so that you will be clear why Tata Nano failed to capture the market. Prior to the launch of Tata Nano, it got lots of attention. So, it got the attention seeking potential, means the power that can grab the attention of the people and that was actually good because if you are from a marketing field, then you must know that it is very difficult to get the attention seeking potential and those products which can get such potential will definitely be a successful one. So, what went wrong with Tata Nano when it got the eyeball attention at starting? Well, Tata Nano got so much attention that even Obama praised it when he visited India, after that it got huge attention not only in India but globally. At that time, no one was actually believing that anyone could make a car at around 100,000 Indian Rupee. So, it got lots of controversies and attention all over the world with the title tag “World’s Cheapest Car”. It got so much hyped market that it got overbooked as a result of which lots of time was taken to deliver the booked cars. So, then why Nano was failed though it was overbooked initially? Was build quality of Nano bad? No. We already mentioned above that comparing with other cheap cars which were manufactured in India at that time, the build quality was not bad. Wasn’t it value for money car? Of course, it was a value for money car because that was the main thing that Nano had offered. Were the marketing campaigns not enough? No, of course not. Instead, it was the talk of the town in those days. Even it got lots of free marketing due to lots of news coverage, social media posting by individuals and so on. It was so popular with the tagline “World Cheapest Car” that everyone was waiting for its launch. Actually, it got the marketing by default, means it got free marketing. So, that time marketing team of Tata was definitely happy due to lots of praises, free coverage in media, free social media sharing and so on. So, then what went wrong there? Like we have mentioned above, Nano was getting highlights by default due to mouth publicity, but not by designing or by choosing the branding slogan or any other proper marketing planning and maybe the marketing team of Tata Nano ignored these factors. So, due to this, the slogan “World’s Cheapest Car” became the huge drawback later for Nano. Nano was launched in India where the society judge people according to the aspirational value they have or they can show to society i.e. the house or jewelry or even a car etc. We don’t mean to say that this happens only in Indian society but actually, this happens all over the world. So, when Nano got the tagline of “World’s Cheapest Car”, it also got tagline of cheap due to which people start to take Nano as an unreliable fragile car with cheap build quality but in reality, that was not the case because its build quality was not too bad as compared with the price it had offered. If the marketing department that time thought about this factor and called Nano the “world’s value for money car” or “world’s affordable car”, then the market would have different at the moment. When people started to feel Nano is a cheap car, they just kept on judging Nano in a various way and just kept on trying to figure out why Nano is cheap, how this car can be made at such a low price and definitely its competitor start to take benefit of that by spreading the negative mouth of word publicity. When such thing was happening, at the same time Tata was unable to deliver the booked car to lots of people because it was heavily overbooked at starting. So, supply became less than the demand and those people who didn’t get Nano after waiting for several months, they also started to spread the negativity against Nano to overcome their anger. People even started to tell their friends and families that they would have purchased a bike instead of Nano. But, in reality, Nano was definitely a lot safer than the bike. Definitely, four-wheeler will be safer than two-wheeler from every angle but people just started to feel that purchasing Nano looks like purchasing a car by a person who can’t afford to buy a car but desperately want to have a car. So, lots of people gone after bike instead of Nano because at least they were happy to say they didn’t like the car in heavy city traffic so they purchased a bike instead of a car. In that way, they can show off more than purchasing the car with “cheap” tagline. Actually, the price was the strength of Nano but due to the same thing, it was called cheap. People started to compare Nano with Bike because in India Bike comes at around 65,000 Rupee whereas Nano was around 100,000 Rupee. So, this comparison made Nano cheaper and people didn’t feel having aspirational value by owning Nano as it was compared with the bike, not with other cars. So, we can say the market positioning of Nano was bad. They should have called it “affordable” or “value for money” car instead. After all, it was not a joke to make a car at around 100,000 Indian Rupee. In order to make a car, there need to consider designing, engineering and production and to make a car in such a cheap price, the manufacturer needs to cut the cost in every detail possible way. So, it was not an easy task for Tata, hats off to them. People even started to criticize the look of Nano by comparing it with Auto Rickshaw but everyone can see that it was far better than Auto Rickshaw, even it was good looking than lots of budget cars in India. But, due to its “cheap” tagline, people just started to downgrade it in every possible way. Actually, we also don’t think the fire was due to the fault in its design, otherwise, how could only around 3 cars were caught by the fire when there were already close to half millions of Nano cars in the market. However, Tata failed to create positive rebuttal on that. They could not do enough to take away this negative campaign which was spreading around rapidly, another mistake by Tata marketing team. People began to call Nano an unsafe car, even they started to recommend purchasing a bike or second-hand entry-level cars like Alto, Santro and so on than Nano. So, owning Tata Nano wasn’t seen as having aspirational value. Tata should have done lots of campaign to generate positive rebuttal or brand value but they didn’t. Maybe later Tata realized their mistake and didn’t make the cheapest car, instead made little high-quality Nano known as GenX Nano which is not known as the world’s cheapest car anymore because the price of GenX Nano is around 2.36 to 3.35 lakh Indian Rupee. 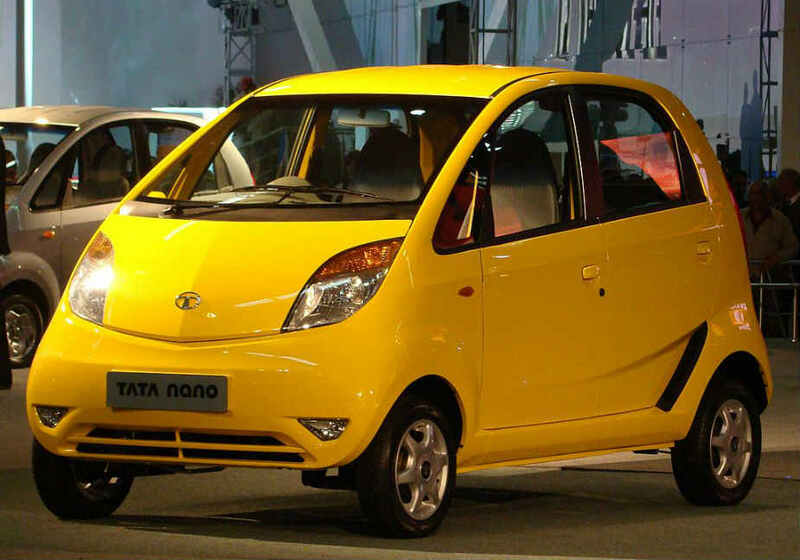 But, due to its negativity in the past, it seems how much Tata trying to bring back Nano with the improved design, material, and new marketing campaign, it still fails to capture the market due to which the sales volume of new Nanos are not any good. So, there is a high chance that soon in the coming days, Tata will stop producing Nano and this all happened due to the little ignorance or the lack of vision of marketing team of Tata. So, the big reason that makes Nano failed was its marketing campaign. They should have known that negative marketing spread rapidly than positive marketing and in order to overcome the negative marketing, they should have done lots of positive marketing, but they didn’t. At starting, Nano should have called “affordable” or “value for money car”, not the cheapest car. Hope this article on Nano has also helped you to learn something about marketing. If you want to say something related to this article, then please feel free to leave your comment below. We will be more than happy to hear from you.